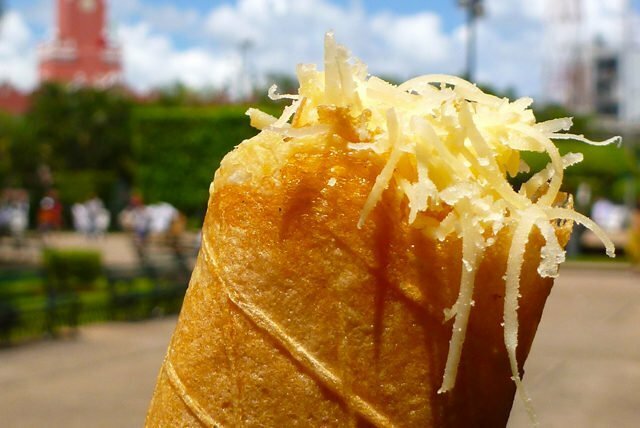 Savor the sweet taste of the marquesitas in Merida - DestinosFun! Anyone who has the chance to explore Mexico, either for work purposes or for leisure, it will inevitably be enjoying a journey through the flavors most typical of the country. Therefore, each region, with its legacies and traditions, produces recipes just as delicious as unique. Definitely it is always a pleasure to surrender to her charms. And if your next destination is to the beautiful and mysterious Yucatan Peninsula, don’t miss your chance and savor the delicacies authentic of this site, so wonderful that the country has! In your passage through this region to visit Merida, the White City, beautiful Spanish colonial town, capital of the state of Yucatan and site where you can enjoy a few unforgettable days. Among rainforests, rivers, exotic flora and fauna, myths and legends maya, you’ll stay extremely pleasurable. But without a doubt, you would not be able to forget, are the flavors get to Know the best secrets of the yucatecan food! When you walk through the streets of Merida, you will feel a delicious aroma that pervades the atmosphere. You will not be able to avoid the temptation to ask questions and find out what it was. Because of insurance are the marquesitas, a small treat that will fill your palate of flavors unmatched and you will enjoy from beginning to end. Do you want to know some of the secrets of this delicious treat sweet? Since this is a roll type crepe or waffle, which, in the first place, the press on a grille of heavy iron, over an open fire, to begin to take shape and consistency. It is a little of the mixture that is used at the time of setting it up, since this preparation must be refined and light. It should be remembered that it is a delight that the locals love to enjoy during walks, or as a snack before dinner. In the time away from the intense heat of the fire, this sizzling thin is filled with a kind of cheese called Dutch edam or, as it is called in Yucatan, cheese ball. And before that harden the crepe, it rolled at full speed to have that very feature that you will hardly see it. You can also fill with Nutella or caramel, it all depends on what you like! Savor the sweet taste of the marquesitas in Merida and feel that’s unmatched combination of flavors, which blended into her fair share of salty and sweet, that will fill your palate with sensations magnificent. When you pass in front of one of these cars that are so characteristic, you stop your progress and purchase one of these small delicacies traditional! Because, surely, it will become a real vice and you can’t help wanting to revel in other more. Enjoy these authentic delights! In most of the stalls offer marquesitas with different fillings and different ingredients, for absolutely all tastes are satisfied. It full of flavors your tours for Merida, a beautiful city to immerse yourself in the most profound and sacred of the culture of southern Mexico!